"I am pleased that this book on Integrated Business Planning has been written. Every executive who thinks he or she has control of their business should read this book. While I was an executive of a business at DuPont in the early 1990s, Oliver Wight Americas was engaged to assess our Sales and Operations Planning process. I looked forward to the assessment because I believed our process was very good. George Palmatier of Oliver Wight took me aside after reviewing our process. In a very provocative and candid way, he pointed out what I was missing as the business leader by not having all functions aligned to one plan and by not being able to see gaps in the performance of the business. George convinced me that my view of Sales and Operations Planning was too narrow. We viewed S&OP as mostly a near-term process for balancing demand and supply. George emphasized that our business needed a process for integrating all functions and ensuring that all plans were aligned and tied to strategy. It is so logical, and it truly integrates the financial plan, the financial forecast outlook, sales and marketing plans, and operations plans. It links tactical plans to the execution of strategy and provides the means to continually challenge the strategy, rather than continuing to rely on an old and irrelevant strategy as market conditions change. It gives management teams greater confidence in making the decision to change plans as market and economic conditions change — because the planning numbers and projections are updated and vetted every month. It is an effective leadership process whether the business is mature, a startup, or a turnaround. DuPont ended up requiring that all of its businesses implement what was named DuPont Integrated Business Management (DIBM), DuPont’s name for Integrated Business Planning. The only other mandatory process at DuPont is Six Sigma. That’s how important DIBM was to the health of DuPont. In my final leadership position at DuPont, I served as the chief executive for a turnaround business. By the time I came to the company, I had three Integrated Business Planning implementations under my belt and could not imagine running a business without the IBP process. Increased the accuracy of our financial plan from being highly inaccurate (±100 percent) to being highly predictable (±15 percent). In implementing Integrated Business Planning, I became a better business leader. Most business leaders like to experiment and develop their own processes, which they strive to continually perfect. With Integrated Business Planning, the process has already been perfected. Instead of experimenting, I was able to use IBP to more efficiently tie together strategy and execution and drive improved business performance. We trusted the plan numbers and projections because we updated them every month. As a result, we did not consume huge amounts of time debating whether the numbers were accurate; we knew the numbers were as close to being accurate as possible. This gave the leadership team the time to focus on our strategy and tactics, given the changes in market conditions that were either occurring or were expected to occur. I also used the integrated planning process as the means to create a culture of self-awareness where we could be safely self-critical of our functional and business performance. The leadership team set targets each year for what we wanted our Integrated Business Planning process to do for the business. This effort included identifying how much to improve forecast accuracy each year. Each year, we identified the volume growth for certain business segments. We also agreed upon the target for on-time delivery performance each year. We monitored performance through the monthly Integrated Business Planning process. Discussions focused on how to make the improvements happen. For example, we focused on how we needed to invest in tools and training to enable our people to achieve the targets. We found that to be successful, we needed a solid demand plan. We invested in training the sales force and providing them with tools to do a better job. The sales team went from not being engaged in the process to being strongly involved in the process. Their involvement accelerated the results we were able to achieve. Along the way, I learned that when implementing Integrated Business Planning, success starts with the business leader’s personal commitment to the process. The business leader must be one step ahead of the rest of the executive team to push and prod for continuous improvement. In singing the praises of Integrated Business Planning, I don’t want to leave you with the impression that implementing it is easy. It is not, and that’s why the business leader needs to be committed and personally involved. Initially, the organization sees that implementing IBP is extra work, especially as the IBP process begins to replace other processes. This extra burden gradually diminishes. As the well-structured, integrated process replaces those old informal processes that are not integrated, the workload eases. When the workload diminishes and the integrated, well-structured process becomes dominant, the organization becomes much more focused. The strategy and tactics are well understood, including how they tie together. The expectations for outcomes, including financial performance, are clear. Rather than arguing about whose numbers are right, the people supporting each function and the management team focus on meeting the expectations of the business and marketplace. distinguishes the difference between Sales and Operations Planning and Integrated Business Planning. explains the integration of product portfolio management and financial planning and management. explains the structure of Integrated Business Planning in a way that is logical and easy to understand. I very much believe in three key things in running a business; that is, strategy, execution, and people. Integrated Business Planning is a fantastic process for tying all three together. I have implemented Integrated Business Planning four times in my career, and, in every case, it was a vital part of the business transformation." Read this book - buy the print version from the Oliver Wight Americas' website. Do you have Nook? Purchase the E-book for $9.99 from Barnes and Noble by clicking here. Over the years I have managed to co-author four books sharing my experiences as a practitioner and as an educator, consultant, and advisor. The first of these books, The Marketing Edge, was written early in my career in helping a broad range of companies. It is largely based upon my experience as a practitioner in the early days of Sales and Operations Planning. Its intent was to get the attention of sales and marketing professionals to actively participate in the company planning processes in a manufacturing company. The second book, Enterprise Sales and Operations Planning, was written well into my consulting career after having helped companies of all sizes and shapes implement the integrated management process known as Sales and Operations Planning (S&OP). I had a strong desire to share my learnings. Colleen Crum and I shared our message in story format to help make it more readable. I am proud of this book. It has received many accolades. The third book, Demand Management was written in response to client requests to provide a solid reference book on industry best practices for Demand Management. The heavy lifting on this book was provided by Colleen Crum. She is the primary author and I provided input and support. This is an excellent book for people working "hands on" in Demand Planning and Demand Control processes. 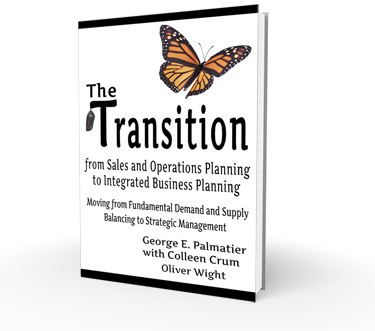 The most recent edition to this collection, Transitioning from Sales and Operations Planning to Integrated Business Planning, has been written to share how leading companies have moved from a basic demand/supply balancing process to a strategic management process. These leading companies have learned to use a disciplined, regular and routine monthly management process to more effectively deal with the increasing rate of change in most industries. We have seen over the years that companies that implement S&OP as the primary process by which they run the business get significantly greater benefits than those companies that don't. The process evolves into a strategic management process. The industry is choosing to call this strategic management process Integrated Business Planning (IBP) to differentiate it from traditional S&OP. IBP is proving to be a highly effective management process for both simple and complex businesses in rapidly changing times. I hope you find one or more of the books of value to you. I appreciate the opportunity to share my experiences from three decades of working with clients that make everything from soup to satellites. Purchase this book now via the Oliver Wight website by clicking here. Effective demand management is becoming critical to a company’s profitability. This comprehensive book provides best practice solutions that will improve overall business performance for supply chain partners and all functions within a company impacted by the demand management process. Presents the fundamentals for developing more reliable forecasts and schedules and shows how to build successful relationships and skills needed for collaborative forecasting and scheduling. Demonstrates how an effective demand management process contributes to sales revenuegrowth, lower inventories, increased profit margins and defines what is reasonable to expect from the process. Addresses technology, the human quotient, and common decision-making elements of demand management that are often overlooked, under-utilized or over-blown and puts them in proper perspective. Includes case examples to illustrate the concepts, principles and best practices of demand management and presents scenarios at the end of each chapter to spur further thought and provide insight on how to apply these principles and best practices. Provides answers for frequently asked questions and complex issues and tackles the myths of forecasting and demand planning. This book is based on the premise that when sales, marketing and manufacturing team up, they can become a powerful, competitive weapon. The Marketing Edge teaches sales and marketing professionals how to effectively integrate their efforts into the overall manufacturing operation. The Marketing Edge shows you how to improve forecasting, build better sales plans, and improve delivery performance to customers. It will give you an edge over your competition and help you achieve the maximum impact -- with sales, marketing, and manufacturing working together. Written by George E. Palmatier, an authority on the integration of marketing and sales into manufacturing operations, and Joseph S. Shull, who has more than 20 years of experience managing sales, advertising, marketing services and market research, and planning and development. Forward by Richard C. Ling.